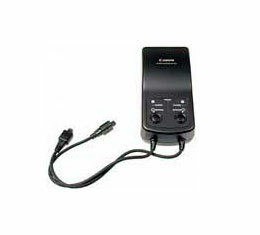 The NC-E2 is a dedicated charger for the Canon NP-E2 Ni-MH Battery Pack. The NC-E2 will quickly recharge the NP-E2 battery pack in about 100 minutes, at the same time preventing excess charging. The charger can charge two NP-E2 battery packs at one time. The NC-E2 also has a discharge feature (takes about 8.5 hours) that will cancel the NP-E2's memory effect. Runs on 100-240v AC, perfect for the travelling photographer.